Spawns two adds follower of the Champion every 10% health (and two at 5% health). Is social with the other goblins around it. This page last modified 2019-02-16 03:06:52. Very crowded area and the named himself is close to 2 other gobs that aggro when pacify is cast on them. Plus of course the named summons a bunch of adds himself. Very interesting area. It's where the gobs socialize and dine. The picture here doesn't show that on the table in front of the Champion there is the corpse of a female halfling and cuts of meat evidently taken from her, or other halflings. Very ghoulish! so how tough the adds? mage pet tank np? 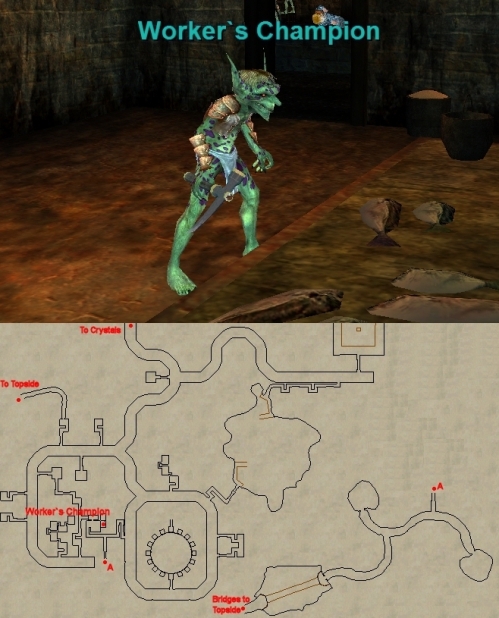 Also meant to post- I've seen him pop from other "subservient goblins" in the area, not just the spot on the map. Dropped http://everquest.allakhazam.com/db/item.html?item=108621 and glowing dreadmote.